We’ve previously talked about scientists warning of an impending food crisis. As our population rises, we may not be able to keep up with our appetite for meat and we’ll need to look at alternative sources of protein. We could eat lab-grown meat, or turn vegetarian, but is there another way? Yes. Bugs. I’m all aboard this insect eating train. If 80% of the world’s nations are happy to munch on bugs, and even consider them a delicacy, why can’t we? Yes, there are some British delicacies I wouldn’t even eat – tripe being one of them. But, in my mind, it’s purely psychological. You might find the idea ‘yukky’, ‘icky’ or ‘gross’– but what if you had to eat insects to survive? Creepy crawlies are high in protein, vitamins, minerals and fats. Edible insects are easy to sustainably farm and produce considerably more ‘meat’ for the amount of food we put in compared to traditional meat farming. We eat similar creatures already – prawns, lobsters and crabs are basically insects of the sea – with exoskeletons that we remove before eating them. In fact, I crunch on the tails of deep-fried prawns, so why should I fear eating a cricket with its ‘shell’ on? As you can see in the video above, I wanted to test my convictions on film. So, I went out and bought some insects – dried meal worms, mopani worms (emperor moth caterpillars), crickets, and chocolate-covered giant ants and a scorpion. I’m happy to say that I ate them all, and my reluctant fellow diners did a good job too, but we didn’t particularly enjoy them. They just didn’t taste that nice, nor did they feel very substantial. I’m going to put that down to the way they were delivered – dried and shrivelled – but I’m confident they could taste good if cooked fresh. Or why not grind them up and hide them in other foods? Most red food colouring is made up from ground up insects (the cochineal), so why not a burger with its main protein coming from worms? Come on, be brave – it’s the future. Well, you can count me out of eating insects. Future society might also expect us to have a robot butler or ride hoverboards to work, but there are some things I’m not sure I can bring myself to do – eating insects is one of them. Watching Patrick and my other colleagues munching their way through a plateful of worms, ants and other crawlies was enough to put me off my dull yet delicious sandwich. I understand that we’re not talking about the apocalypse – we won’t be digging live worms out of the ground to munch on. The proposed alternative to traditional ‘meats’ is something like a reformed protein – made up of the (admittedly quite nutritious) pulp of insects and formed into something with fewer visible legs. But I’m still not sure that, knowing it was an insect, I could actually put it in my mouth. I appreciate that we need to preserve the world’s resources, but as an arachnophobe and the sort of person who runs screaming down the street at the sight of a cockroach, I think that I’d be happier taking a different route. If ‘real’ meat runs out I’d happily eat a lab-grown burger or just cut meat out of my diet altogether. But worms and crickets? Think I’ll pass, thanks. If push came to shove, would you eat insects? If American can stop doing shows like Man vs Food, or all thos mad huge platter challenges, I’m sure we can survive for much longer. afford fish and usual animal proteins. I have eaten greenfly since I was a child, they are sweet & tasty. I got the idea after learning that ants farm them for the honey like substance they excrete, licked some off a plant and never looked back. As a result I have tried most insects, uncooked a lot of them are bitter tasting [to deter predators I think]. Preying mantises make me violently ill and there are some poisonous bugs out there. Cockroaches, after seeing them in so many cesspit’s I have a real problem with eating them. Best way to start on bugs is to get drunk and start munching. My Garden, i’ve grown up and have my own now; friends gardens / smallholdings; when out in the sticks [away from farms & cultivations as the danger of herbicides / pesticides is ever present]. My praying mantis actually fell into my lap…. Visiting Jamaica I was up in the mountains sitting on a veranda outside of a shack, the one light bulb was above my head attracting loads of insects, besides the bulb lurked a mantis, this must have been his version of an all you can eat buffet. Anyway somehow he lost his grip and fell into my lap…..I must admit I was sampling the delights of Wray & Nephews overproof white rum, and this provided the courage I needed to pick it up and start munching. Never again not unless it’s fired crispy Chinese style. and pepper whether cooked or uncooked. I don’t think there is any question that if you had to survive you would eat insects. However, from a position of comfort, no thanks. Unless perhaps cooked by Ray Mears? He’d know which ones are good for you and taste good and how to prepared them nicely, and which ones to steer clear away from. Survival of the fittest and all that. talking abt a life and death situation so can’t be choosy. I have to throw my hat in the ring and say I’m on Patrick’s side. I nibbled on the meal worms (keyboard food I called it – it tastes like stuff that falls out of it if you give it a shake), and it was fine. The caterpillar was less palatable, with a fishy aftertaste that took a packet of fruit pastilles to get rid of. But I’d happily convert – as long there were some chocolate covered ants left over for dessert! Patrick said that the chocolate-covered ants contain ‘energy giving enzymes’. The Advertising Standards Authority might be interested in that claim. Ah but wavechange, the ones you linked aren’t real insects. We wouldn’t get to see Which? staff suffer with those! I knew they were chocolate and not real insects, but I did like the name. Lesson 1 from evolution: The feeling of disgust is a primeval reflex – there to protect us from foods that might harm us. The reflex becomes socialized during our early upbringing: “Don’t put that in your mouth, it’s dirty!” and even into adult working life: “Now wash your hands”. It’s very hard to unlearn reflexive instincts in later life. So I’ll just pass on the bugs, if you don’t mind, and say it’s my Mum’s fault. Lesson 2: Successful species have survived through their ability to adapt and diversify. I don’t see any point in competing with 80% of the world’s population for the food they enjoy eating. I’ll stick with roast beef – which a significant percentage of the world’s population wouldn’t touch with a barge pole. If meat’s not available there’s nothing wrong with roast potatoes – cooked in vegetable oil – and sprouts. Or it might just be my turn to die of hunger – as millions do in this unfair world – and let evolution take its course. @Patrick – thank you for your kind invitation to eat at Maison Steen this Friday. Unfortunately, I have already accepted an invite for dinner at Ms Whiteman’s (for Friday, or any other day you care to mention!). You are right in part about the primeval reflex – it’s the same reason we’re afraid of spiders and snakes. However, I think smell is more of an indicator of something we shouldn’t eat (off meat/fish etc). Plus, other cultures would feel disgust at some of the things we eat – eat milking cows is seen as odd in most of Asia. Oh and you’re missing out on Paddy’s special worm risotto! I think of honey as urine-coloured insect vomit because I’m diabetic and it helps. Might it be more effective to wean people off unsustainable forms of protein with aversion therapy than try to kid them that insects etc are palatable? Have no problem whatever about eating insects. Finally I did survival courses in the Services – mainly because I could camp backwoodsman style and be paid for it! We were taught that vast amounts of insect life was nutritious if prepared properly – palatable. (Some are somewhat poisonous) Soups were good.with appropriate seasoning – After all most food we eat today is not very palatable if eaten raw. Have you ever eaten raw chicken? We already do. Honey has seen the insides of bees and cocchineal food colouring is derived from ladybirds (ladybugs in the US). People inadvertently eat tens if not hundreds of insect fragments daily. As with other animal groups that we eat, it is not possible to make sweeping generalisations as to whether they are palatable, nutritious, or – at the other extreme – poisonous. Much of the (largely) western aversion to eating insects is cultural; in modern times we do not eat insects and other ‘creepy crawlies’ such as worms as we did in earlier days. The caterpillar of the goat moth (Latin name Cossus cossus) was a delicacy to the Romans, and one well known publication – well, at least to me and some other entomologists who might advocate the consumption of insects, is titled “Insects – A Victorian Cookbook.” The French eat snails, though of course these are molluscs, not insects. Processing some insects might make them more palatable or at least more appealing, but the cost and energy required for processing them is a factor, and should only be done where essential for food safety reasons or ito soften tissues that would otherwise be difficult to chew or digest. Most of the insects that are eaten are vegetarian and carry a relatively low food poisoning risk. Just think how many people get ill and worse each year through such infections as salmonella and listeria after eating such ‘innocuous’ foods as chicken and cheese. Live shrimps and prawns are ostensibly very similar to many living creepy crawlies, while crabs with their hard exoskeletons and eight legs can be considered marine spiders. Much of the aversion to insects is that they are unfamiliar, and humans (as do many animals) have a tendency to be cautious over trying new foods. We are also too often taught that creepy crawlies are ‘nasty’, an association that for some individuals is hard to shake off. Anyway, time for my breakfast. Moths on toast, anyone? I’ve tried live termites a couple of times – they taste exactly like iceberg lettuce! And a few cheeky ants from a lemon tree that tasted citrus-y delcious. Not sure I could do the big juicy grubs, although if you chopped them up and smothered them in enough garlic…. I’m impressed and slightly in awe that so many of you are into eating bugs…..I think I’d rather return to my vegetarian ways than eat an insect. Anyway before you start foraging in your gardens for delicious treats I think some caution should be exercised. I am sure there are some nasty poisonous bugs out there and wouldn’t want any of you to get sick. Thanks for the the words of caution; I have no intention of eating any bugs … and yet I still feel sick! Oh go on. Sure you could find some meal worms in a shop near you! The local supermarket is out of stock this week – although I managed to get some flour mites there once. 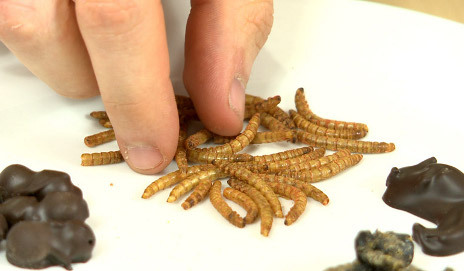 I’ve also tried the pet warehouse and meal worms are £39 per kilo, and very high in fat. It doesn’t say they are free-range or even fit for human consumption. I could have best fillet steak for that money. maggots crawling inside having had their bites first? ‘Thank you’ Argonaut for adding to the most revolting information I have seen on Which? Conversation. It does not trouble me the slightest that harmless bacteria and fungi are used in cheese production but the thought of maggots in food is horrible. I read the Wikipedia entry too. What revolted me most of all is that the maggots can survive the acid pH of the stomach and cause mayhem in the intestines. This cheese is potentially dangerous, like eating undercooked pork. Mimolette from northern France is deliberately infected with cheese mites – basically the same as flour mites – to add flavour. Before refridgeration, a whole round of Cheddar could be bought to last the winter and it would gradually develop mites. By the end of the season, up to 25% of the weight of the cheese could consist of mite debris. Mmmm, cracking! I’d have no problem with eating insects either alive or cooked provided they weren’t poisonous. However, I think I’d rather swallow them whole than chew them up. Stefan Gates, the presenter, is welcome to my share. Rockefeller with a touch of caviar, a little bit of Creole shrimp, trout with lemon-butter sauce (Capitan Sisko’s recipe), some Caesar salad and….a giant chocolate sundae !!! I understand that amongst you guys there are several people who find Bug Cuisine most appealing. My dear friend Quark is willing to give you (for a price) the recipes of the most delicious Ferengi dishes, like flaked blood flea, jellied gree-worm, millipede juice, puree of beetle and many other delicacies. Just send him a subspace message.